This is a sponsored post about the HMV music app. I have been compensated for this #shop by Collective Bias. All opinions are my own. Twitter I get – it started as Twitter, it still is Twitter. Nothing really has changed, so I understand it. Music on the other hand, music in my mind belongs on cassette. Many a happy hour I whiled away in my bedroom as a teenager burning candles and sighing about life whilst listening to a tape of the Top 40, recorded off the radio. You could spend an entire day putting together the perfect mix tape, carefully lining up the two sides of your double tape deck, writing the track names on the cardboard insert in your coolest handwriting. It was a simpler time. I struggled enough with the concept of CDs and not having to rewind things manually to find my favourite songs, so you can imagine how I feel about music downloads – it’s basically witchcraft. I do have an iPod, but I bought it about five years ago, put all my music on it, and haven’t changed it since. I don’t know how to update it without deleting it all. To be honest I couldn’t actually tell you right now how you turn it on. 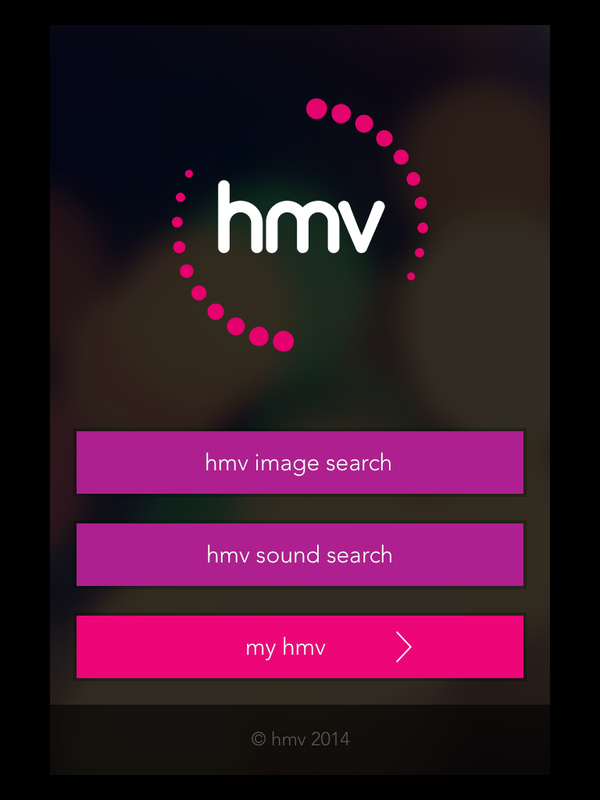 Although the functionality is more limited, you can use the music and image recognition software and use the app to access music you have bought from the HMV digital website or from the app on another device. The HMV digital website is incredibly simple to use, even for a buffoon like me, and once you’ve set up your account and registered your card details you can make purchases easily from any device. You can browse by genre, search for an artist or album title, and buy whole albums or individual tracks. If you have an Android phone though, like me, then you’re in for a treat. With the Android app you not only have access to the sound and image recognition programmes, but you can also browse and purchase music directly, without having to go to the website. 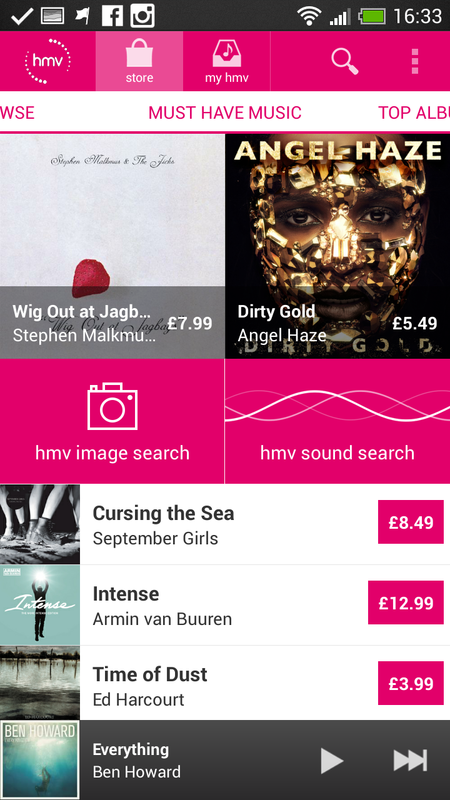 Again you can search by different categories and genres and the ‘My HMV’ tab gives you access to all the music you’ve bought, either through the app or on the website. I really like that you get a 30 second preview of any track, so you can listen before you buy. This is especially useful if like me you’re not very good at names and are never really sure which song is which. 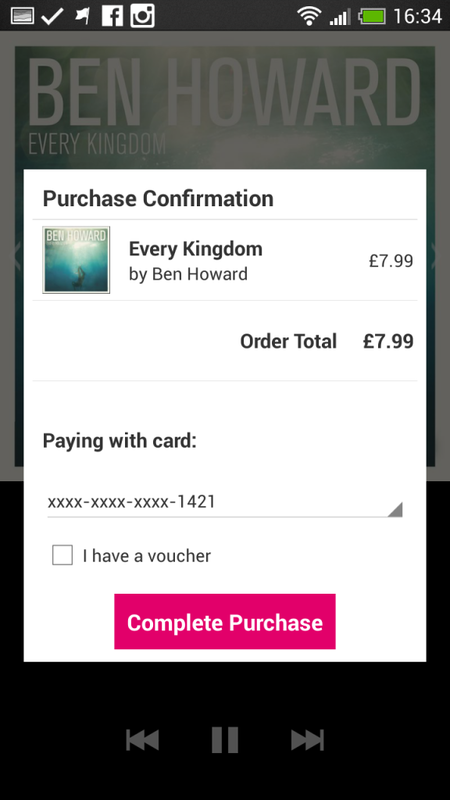 Whilst you’re listening to any preview you can tap the screen at any time to make a purchase. Buying the music is easy peasy, you just tap the screen and tada! You don’t have to go to Woolworths or wait for the postman or anything. 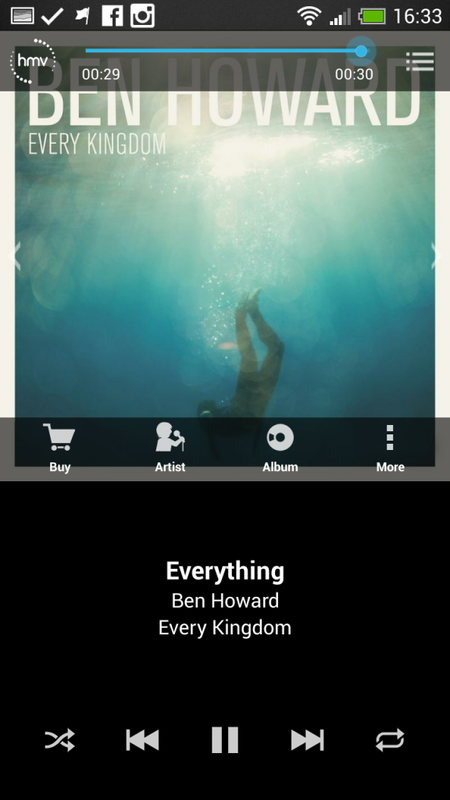 I bought the Ben Howard album and the soundtrack from The Secret Life of Walter Mitty. (I thought the track where he skateboards down a mountain in Iceland might be a good motivational running track. I need all the help I can get). I bought one through the app and one from the HMV digital website, just to test that it would all end up in the same place. So, you buy the albums and there they are. You can stream them straightaway or download them to your device. The bit I just can’t quite get my head round is that as soon as you have bought them, they appear everywhere as if by magic. (Seriously, how does it even work? Where is the Internet even kept?) I could play them from my laptop, from my phone or from my iPad – genius. 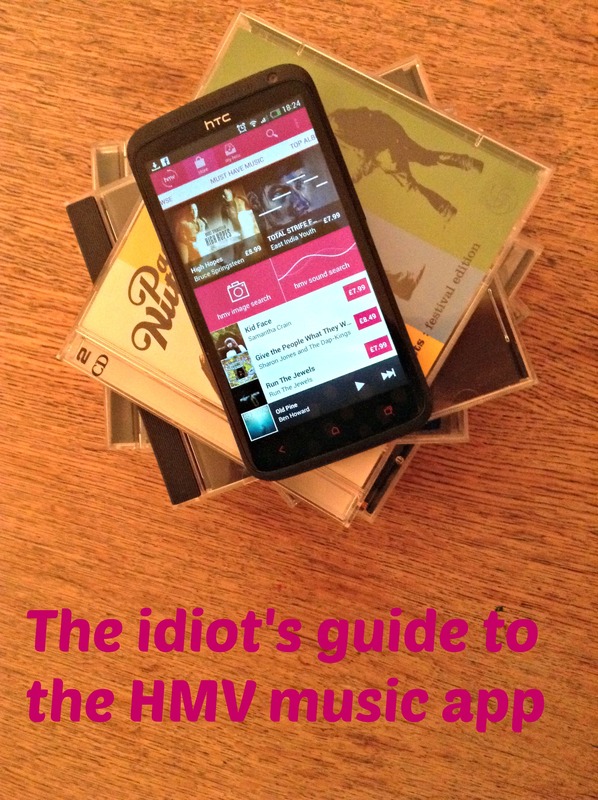 The HMV music app really could not be simpler. The whole process was incredibly easy and I would definitely recommend it, even for someone like me who appreciates why a pencil is a crucial part of a cassette collection. *No offence, but let’s face it, we’re not kids any more are we? You undoubtedly ensure it is appear really easy and your presentation but I find this trouble being basically the one thing i always think I will in no way comprehend. It seems like very difficult and very extensive for me personally. Now i am anticipating as part of your subsequent distribute, I most certainly will make an effort to find the hang on of the usb ports! I heard a lot about the HMV music app but I never downloaded it..
awesome music app that I would like to list it on my site. thanks for the review.